The Donald J. Trump administration has released its National Security Strategy (NSS). Media attention and analysis of the document has rightly highlighted the prominence of Russia and China, identified as revisionist powers that “want to shape a world antithetical to U.S. values and interests.” Observers have also remarked upon the incoherence of a strategy that claims a role for “competitive diplomacy” and “advancing American influence” while slashing the budget and the personnel of the State Department. And of course, the elephant in the room is whether the president actually believes what the strategy outlines. But one lesser-discussed area worth further attention is the more prominent place given to India and the Indo-Pacific region in U.S. national security. The NSS describes its components in four sections—following the four “pillars” of the strategy—that lead the document: “protect the American people,” “promote American prosperity,” “preserve peace through strength,” and “advance American influence.” Following these pillars, a final section charts out “the strategy in a regional context.” This format differs from those of previous NSS documents which tended to interweave specifical regional priorities within the outlines of strategic goals. This section, while covering the challenges of China’s militarization of the South China Sea, Belt and Road investments, and North Korea, presents U.S. “allies and partners” as the centerpiece of American strategy, leading with South Korea, Japan, Australia, and New Zealand. The document welcomes “India’s emergence as a leading global power and stronger strategic and defense partner” and it calls for more cooperation with the “Quad”—Japan, Australia, and India. It also pledges to “expand our defense and security cooperation with India, a Major Defense Partner of the United States, and support India’s growing relationships throughout the region” (47). How did previous NSS documents feature India? In the Barack Obama NSS of 2015, the president’s prefatory letter mentioned the rebalance to Asia and unlocking “the potential of our relationship with India” as among the “historic opportunities” before the United States. That strategy emphasized U.S. interests in strengthening “our strategic and economic partnership” and honed in quickly on the shared values of the United States and India as “the world’s largest democracies” (24). The George W. Bush administration placed a high priority on transforming ties with India, and indeed it was the Bush administration that spearheaded the civil nuclear agreement so critical to ending decades of estrangement between New Delhi and Washington. In its 2006 NSS, the Bush administration’s first mention of India noted that “relations between India and Pakistan have improved” (14). Later references to India focused on the country’s role as a global engine of growth (26), a partner in the Asia-Pacific Partnership for Clean Development and Climate (27), and highlighted that the United States had “set aside decades of mistrust and put relations with India, the world’s most populous democracy, on a new and fruitful path” (35). And the Bush administration’s 2002 NSS contained more references to India (sixteen) than any of the subsequent documents. While the first reference to India came in the context of “the need for India and Pakistan to resolve their disputes,” further attention to India as part of the 2002 strategy looked at India’s “potential to become one of the great democratic powers of the twenty-first century” and sought to “transform” this relationship (10). So in terms of regional focus, the Trump administration’s adoption of the larger Indo-Pacific framework and its elevation to the top of the regional strategic priorities boosts India’s place in terms of strategy. The bigger questions, of course, lie in the degree to which this NSS will guide the administration’s actual policy steps. And that’s where we can see through some visible holes. As many have noted, the Trump administration’s goal of expanding partnerships across Asia and emphasizing the norm of a “free and open Indo-Pacific” now lacks its most important and hard-fought initiative: the Trans-Pacific Partnership (TPP). India, of course, was not a TPP member. But there is now no larger Asian trade architecture in which the United States participates that might have, down the line, appeared attractive to India to advance its own trade interests and domestic economic reforms. And as I’ve written elsewhere, there is an Asian economic consultation, the Asia-Pacific Economic Cooperation forum, in which India’s absence is glaring—but no U.S. administration has taken up this gap and it has not been mentioned by the Trump administration. Secretaries Rex Tillerson and Jim Mattis have referred to the challenges posed by China’s infrastructure investments across Asia, but even as Tillerson has proposed partnership with India on transparent regional infrastructure financing, the Trump administration’s treasury secretary has not supported an expansion of World Bank lending. 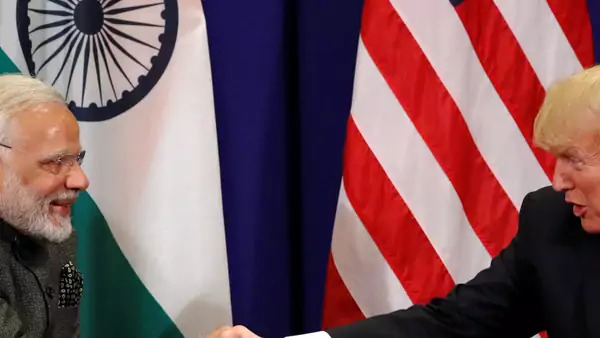 And despite the stated interest in expanding economic ties with India—and I readily admit the economic side of U.S.-India relations is prickly at the best of times—the Trump administration’s approach emphasizes a trade deficit with India of $26 billion. This amounts to a tiny fraction of the more than $300 billion trade deficit with China. Given that New Delhi also has concerns about India’s trade deficit with China, measuring progress with India in terms of the trade deficit rather than continued progress on market access, and a more positive vision for cooperation) seems like a strange point to stress. Which is all to say: the new NSS offers a new prominence for India as part of the American approach to a higher-profile Indo-Pacific region. But whether the Trump administration will be able to fill the crucial economic gaps in the India and Indo-Pacific strategy remains an open question.